The south east of Koh Pha Ngan is dominated by the mountains that occupy virtually the whole region. Apart from the lowlands of Ban Tai and Ban Khai, the rest of the landscape is formed in rugged granite, with steep hills leading up to lush peaks covered in tropical rainforest. The region's beaches are varied with inaccessible getaways found on the east coast, the long winding beaches of Ban Tai and Ban Khai and infamous Had Rin, the party capital and most densely populated place on Koh Pha Ngan. Had Yao (east), Had Wai Nam, Had Thian (east) and Had Yuan are all small beaches catering for long-termers and those who really want to get away from it all. As the sun rises on the east side and the power comes from generators, most people let the daylight hours rule their days; waking at sunrise and crashing out when the sun goes down. The steep cliffs break up the coastline and the absence of a coral reef allows year round swimming. The rugged terrain prevents vehicular access to any of these beaches, thus you can walk to them over the mountain path or go by boat from Had Rin. Had Rin has become the global party centre of the world, attracting up to 30,000 people to the Full Moon Party at new years eve and 10,000 on an average Full Moon. The town has grown to accommodate these visitors and Had Rin has a great variety or restaurants, accommodation and nightlife options. There are over twenty clubs, scores of bars and restaurants serving every cuisine under the sun, from Mexican to Indian or whatever else you fancy. On the west coast, the landscape softens and coral starts to appear, the beaches are long unbroken white sand, populated with well-spaced resorts. Ban Tai and Ban Khai are popular places for folk who want to get away from the hubbub of Had Rin and Thong Sala, whist still being near everything. There is a bit of nightlife in the region, with the infamous Black Moon Party two weeks after the Full Moon Party, and The Place, a club/bar run by the same firm. There are also a few "lady bars" dotted along the main road. There are numerous attractions, including the temples of Wat Khao Tam and Wat Pho, the biggest tree on the island and a road network that links to most places on Koh Pha Ngan. There is a vetenary clinic, Phangan Animal Care, very well run by western volunteers; several spa and sauna operations and many cheap restaurants in the villages. Had Rin has a private health clinic run by the respected Bandon International Hospital Group and the west coast is not far from the main hospital just outside Thong Sala. Had Rin has a sub-police station near the main taxi rank and the west is served by Thong Sala's district police station. Haad Leela is a well-known beach on the sunset side of the Haad Rin peninsula. 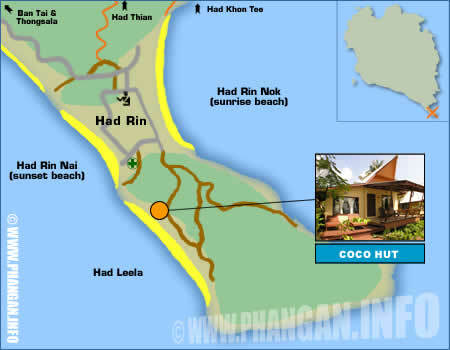 If arriving at the Haad Rin peir Coco Hut Village is approximately a 15 minute walk up over the hill on the left and back down to the beachfront.